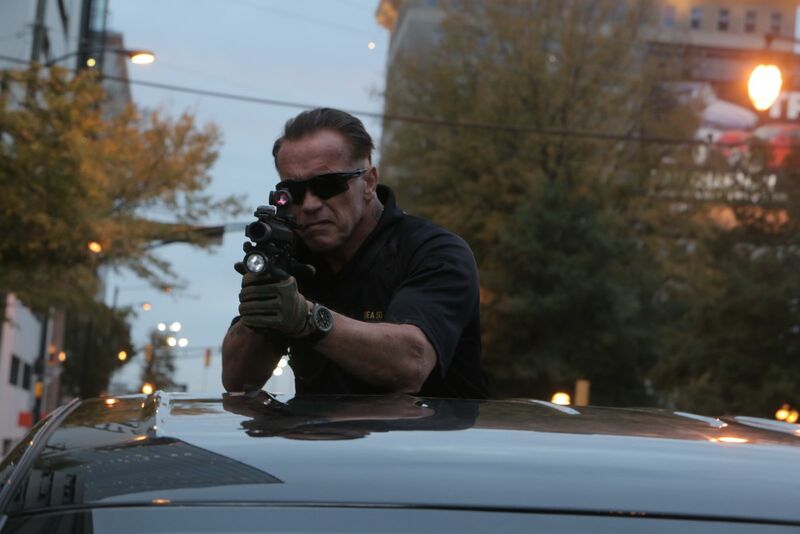 The last two films in Arnold Schwarzenegger’s comeback tour have provided schlocky but enjoyable titillation, with The Last Stand edging out Escape Plan as the better of the two. Directed by David Ayer, Sabotage (2014) has loftier ambitions, but despite some solid work from its leading man the film is tripped up by its messily executed plot. Loosely based on Agatha Christie’s novel Ten Little Indians (yes, really), Schwarzenegger stars as John ‘Breacher’ Wharton, leader of an elite team of DEA agents looking to swindle $10 million from a cartel. What initially looks to be a successful heist proves anything but; the stolen loot goes missing, and the team fall under heavy scrutiny from their superiors. A lack of evidence means the investigation is soon dropped, but one by one the team are soon picked off by unknown assassins. This certainly isn’t the premise of a typical Schwarzenegger movie, and if you’re after one-liners and action man clichés, you’d be better served looking elsewhere. Ayer’s latest is designed as more of a mystery thriller, but both surprises and thrills are in short supply. The main problem is, intentional or not, there are too many unlikable characters. For the first act or so, there looks to be an interesting family dynamic at play within the ragtag group, with Ayer’s penchant for cop banter – so effective in his last film, End of Watch – on full display. Once the team start getting bumped off, however, that chemistry disappears and the character flaws quickly become abundantly clear. Before long, we’re wondering how these unruly psychopaths have been around one another for so long. Additionally, there’s a half-baked revenge sub-plot in Skip Woods’ screenplay that comes to an unsatisfying conclusion late-on. There are fewer action scenes than you might expect from a Schwarzenegger movie entitled Sabotage, but it hits hard when it comes, a visceral opening sequence effectively setting the tone. A climactic car chase is a high point – superbly shot by Ayer – but the violence is almost brutal for the sake of being brutal, with gory deaths doing nothing to elevate the story. For all of Schwarzenegger’s star power however it’s Mireille Enos’s Lizzy who makes the biggest impression, standing out from a posse of macho men and stealing every scene she’s in. As for the rest of the envious ensemble, Olivia Williams and Harold Perrineau make for likeable homicide detectives whilst Joe Manganiello, Terrence Howard, Josh Holloway and Max Martini are largely wasted on one-note characters. Arnie completists will enjoy seeing the Austrian Oak on good form, but as a whodunit thriller Sabotage is found severely wanting. This entry was posted on May 10, 2014 by Amonymous. 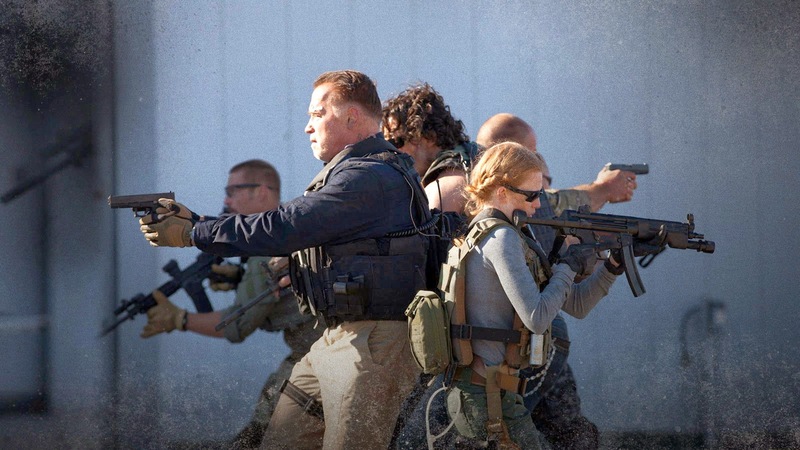 It was filed under Film Reviews and was tagged with Arnold Schwarzenegger, David Ayer, Harold Perrineau, Joe Manganiello, Josh Holloway, Max Martini, Mireille Enos, Olivia Williams, Sabotage, Sam Worthington, Skip Woods, Terrence Howard. I couldn’t help but hate the guts out of this movie. I don’t know what it was, but the script was just so bad and corny, that I felt like they were trying to go for the old-school, 80’s action-thriller vibe, but it just felt so tacked-on and unoriginal. Pretty boring, too. Good review Amon.